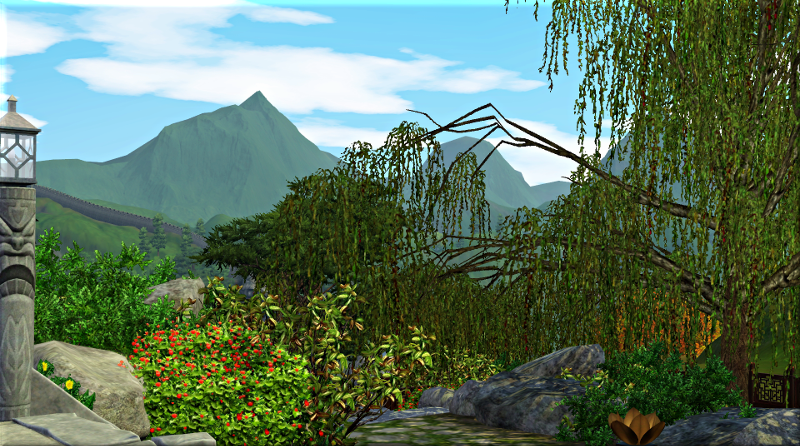 My beautiful vistas research inspired me to build a couple of things for Shang Simla. 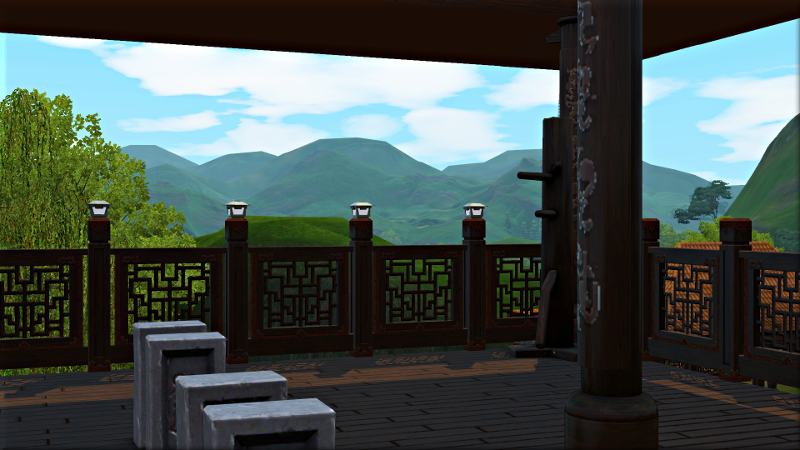 Here is the first of them, a place for your sims to hone their martial arts skills, enjoy a relaxing steam bath, or grab a quiet drink. The build is for a 40×40 lot. 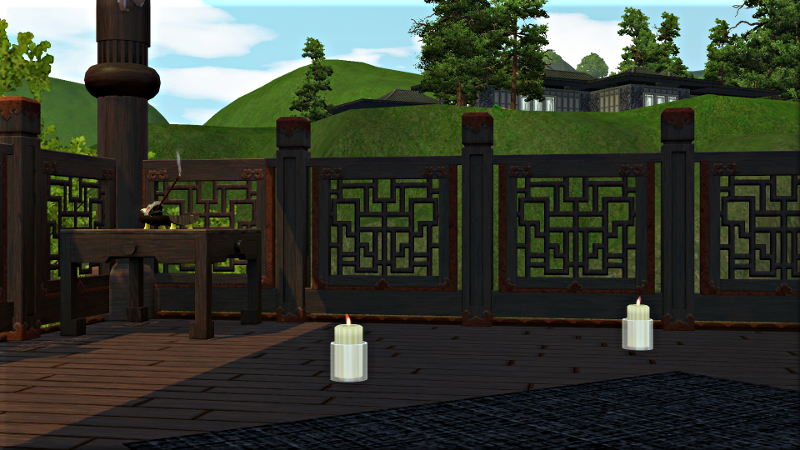 I have it placed at 220 South Shang Simla Hills, a difficult location to landscape for, as the pathways that lead to it stop before the lot border. If you’re building for a more conventional lot with direct road access you’ll probably want to extend my terrain painting to the front of the lot. Some shots of the grounds. Lit up at nighttime, with the Dragon Cave in the background. 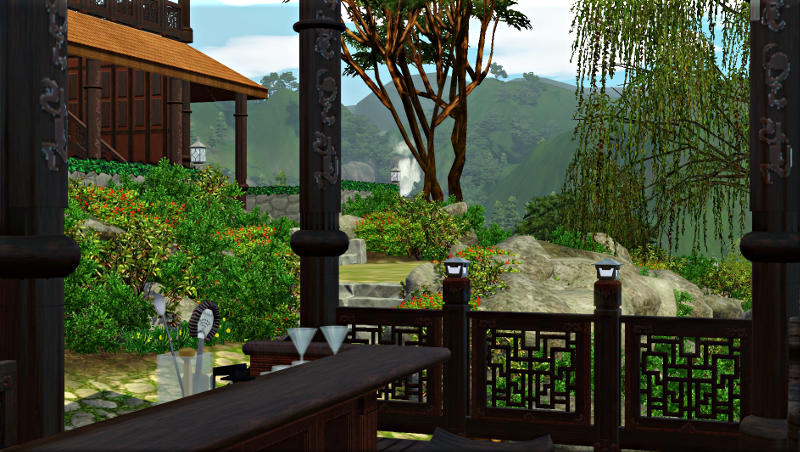 You may wish to rezone the lot as a Chinese garden for additional +20 moodlet and boost to martial arts skills, but in my game I have it set as a small park for access to the popular drinks mixes. Order a Dark Energies (§11), Sweet Hijinks (§11) or Vera’s Glass of Sass (§11) to keep your sims awake or an Alien Brain (§12) to help them gain skills faster. If they want to practice their martial arts, I’ve left the lowest level of the larger building empty for sparring matches. Upstairs are two training dummies and two blocks. At the very top, I’ve set up a little meditation area. There is a nice view of the sunrise. My sims like to come up here for some quiet time. 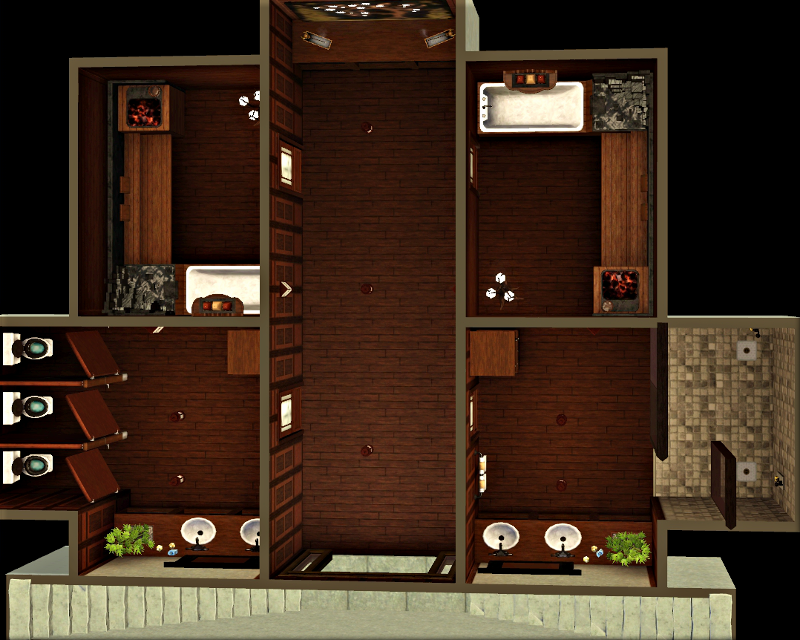 The bathrooms and saunas are all underground. Everything is upgraded to unbreakable. 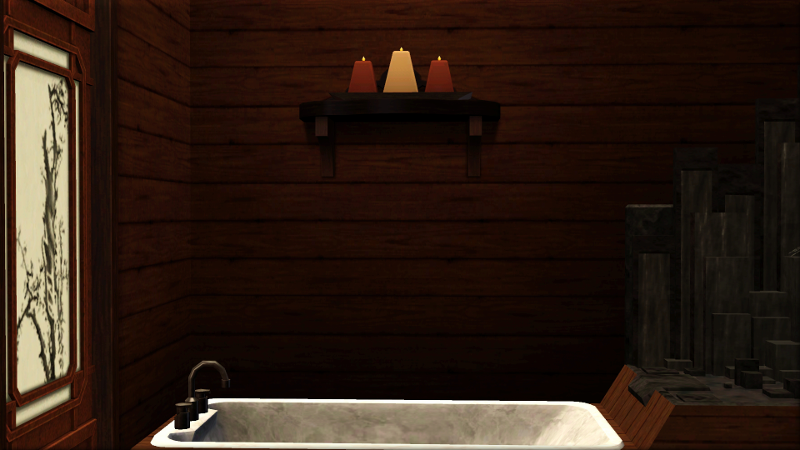 A hydrotherapy treatment will remove the ‘fatigued’ moodlet, allowing your sims to carry on training. Wow! This is gorgeous! Good work! Thank you. Glad you like it 🙂 Yeah I figured it might be a bit of a niche build; just wanted it for my own game. I’ve had a chance to see it in game now, it’s just gorgeous. 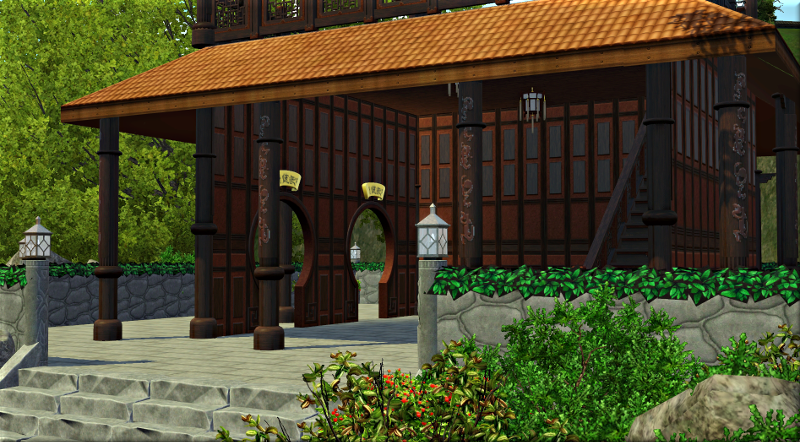 There are so few recreational lots for China, I appreciate you sharing it. Yes, China could definitely do with more fun lots. 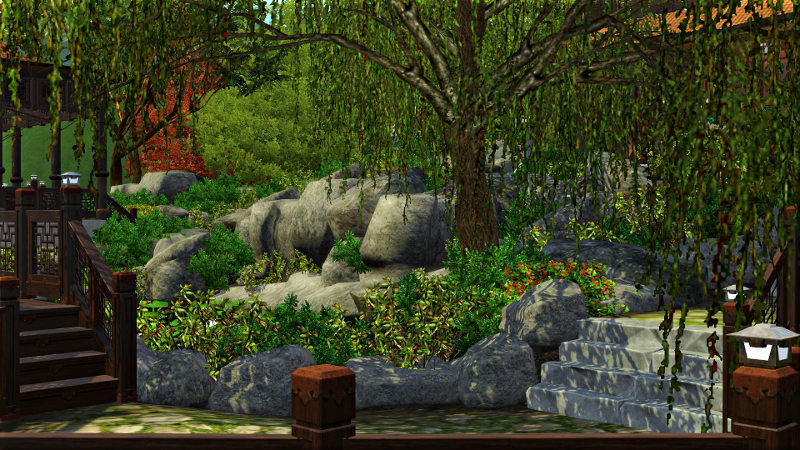 I’m going to make somewhere for my sims to sell their photos next, with maybe a lunch place next door on the same lot. 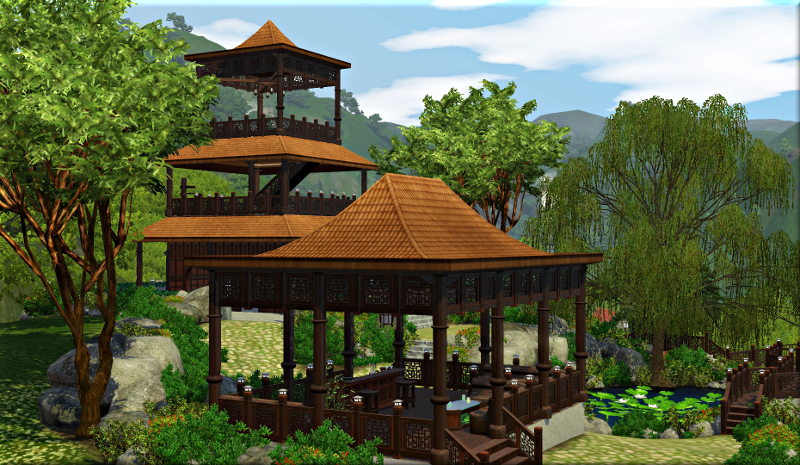 I haven’t put your hot springs makeover in yet but I’m really looking forward to checking it out in game. A massage, dim sum and tea will be a great combination! Did I see you saying somewhere that you also had a dim sum place for the town centre? There is just something about ‘visiting’ the lot that just can’t compare to looking at pictures of it. 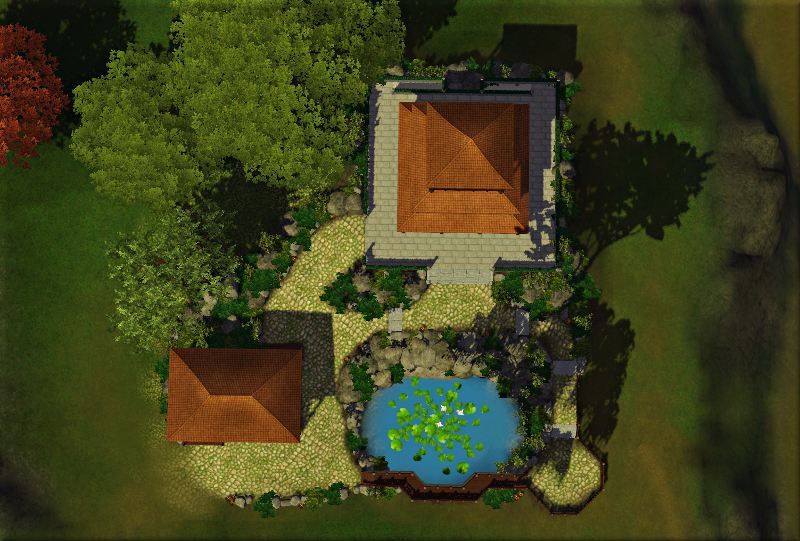 Yeah I had this one from a few years ago, https://www.thesims3.com/assetDetail.html?assetId=7898653 I swapped two of downstairs tables for a tea table in my game but it didn’t seem like a significant enough change to warrant re-uploading it. https://78.media.tumblr.com/89c65240ab613e9ce0711e84aeb385c6/tumblr_p5idagjLOb1x95scjo1_1280.jpg It’s redundant with the hot springs makeover, but I still like having a place in the town areas for my sims to relax and eat while on vacation. 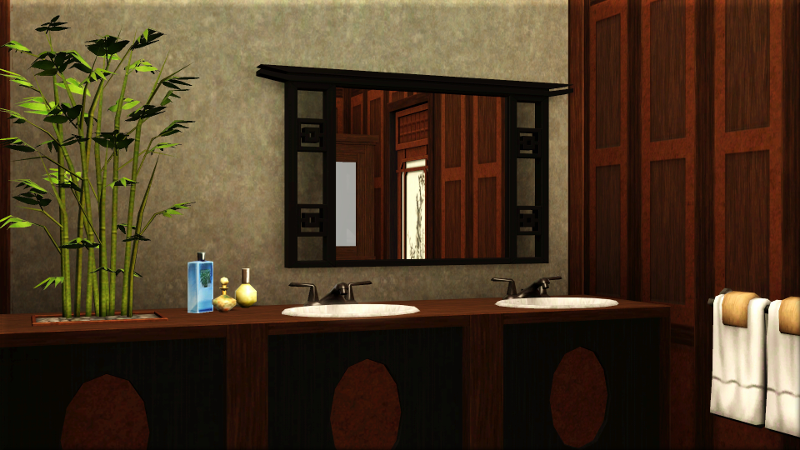 I had originally uploaded a teahouse for the other side of the town centre that had a bathhouse upstairs but I don’t like the layout anymore. 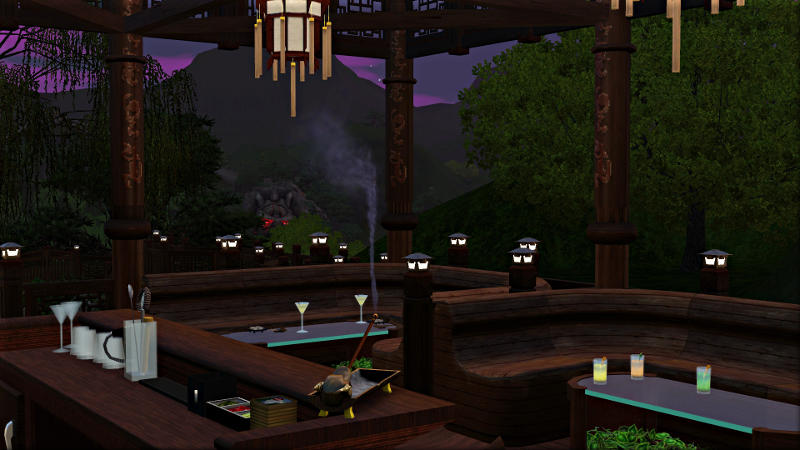 I had started to redo the teahouse now that there is a teaset instead of the Uni bar, but decided to redo the hotsprings lot instead. I hope you’ll share the shop and lunch place when you are done, that sounds lovely. Oh yes I remember this! It’s so pretty. I will grab that too. I think it’s nice to have places to eat all over town. 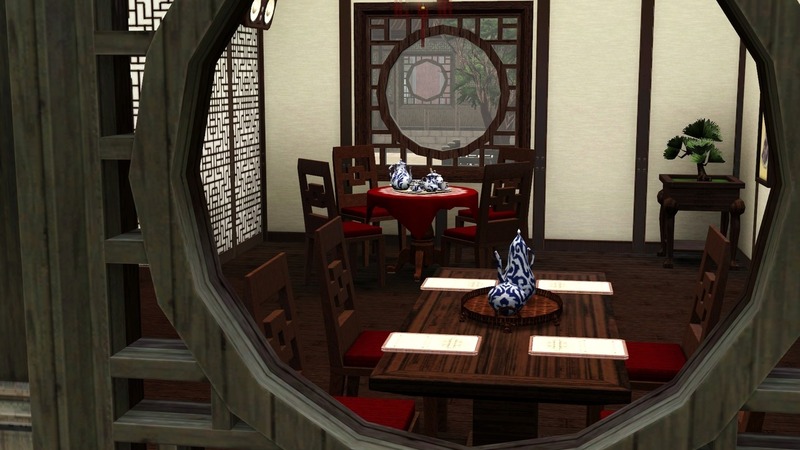 No one’s allowed to cook in the coming generation of my skills legacy, so my sim will be eating out a lot! 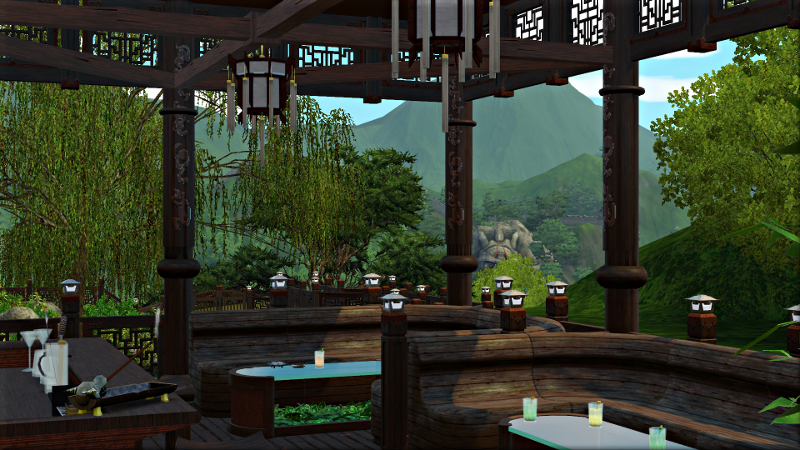 Your teahouse sounds lovely too. I hope you decide to upload it eventually in a form you are happy with. Incredible breathtaking place to be ! 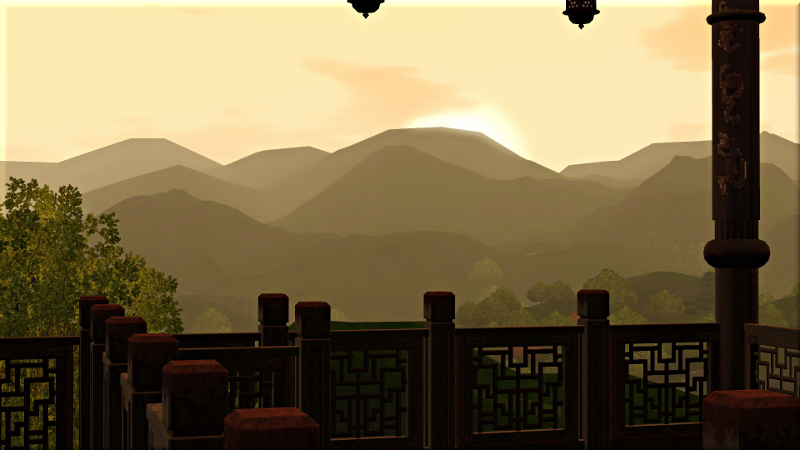 I went a time to Sims China I loved it but I didn’t stay. I wish to come back. 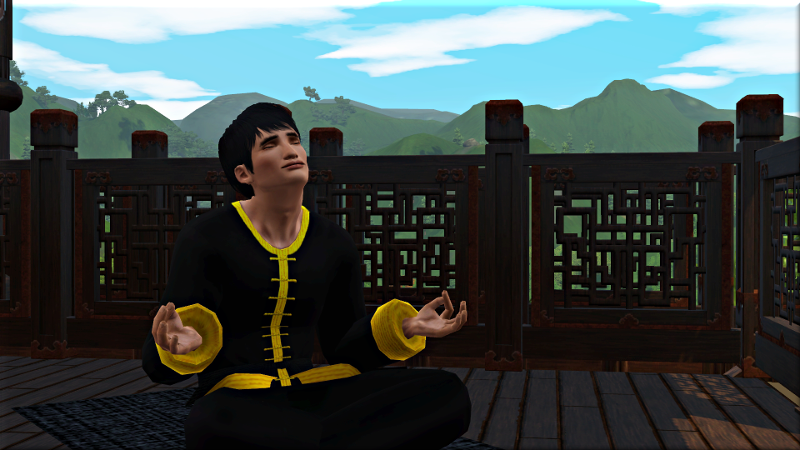 I am not currently in Sims China but I hope to be back when my simself will have the wish and enough money to travel.